Everliving God, who didst call the women at the tomb to witness to the resurrection of thy Son: We offer thanks for the courageous and independent spirit of thy servant Pandita Ramabai, the mother of modern India; and we pray that we, like her, may embrace thy gift of new life, caring for the poor, braving resentment to uphold the dignity of women, and offering the riches of our culture to our Savior Jesus Christ; who livest and reignest with thee in the unity of the Holy Spirit, one God, now and for ever. Amen. Pandita Ramabai (23 April 1858, Maharashtra- 5 April 1922) was an eminent Indian Christian social reformer and activist. She was a poet, a scholar, and a champion of improvement in the plight of Indian women. As a social reformer, she championed the cause of emancipation of Indian women. A widely traveled lady, she visited most parts of India, and even went to England (1883) and the U.S. (1886-88). She wrote many books including her widely popular work titled The High Caste Hindu Woman, which showed the darkest of subject matter relating to the life of Hindu women, including child brides and the treatment they receive by the government. She had a strong view of what should be accomplished so women would be able to have more freedom, including protection of widowed women and child brides and she was also against the practice of suttee. 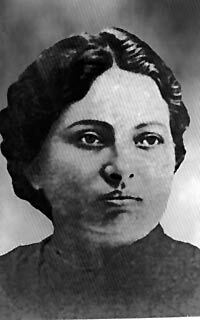 Pandita Ramabai was born into an intellectual Brahmin family. Her father believed that women should have an education and against traditional Hindu social structure he taught Ramabai how to read and write Sanskrit. Her father, mother and sister died of starvation during the famine of 1874-76, and her brother and she traveled around and eventually ended up in Calcutta. After her brother's death in 1880, even though it was considered inappropriate for a Hindu to marry into a lower caste, she married, on November 13, 1880, Babu Bipin Behari Medhavi, a Bengali lawyer at Bankipore, who was not a Brahmin. Six months after the birth of their daughter, Babu died, and Pandita was once again left with just one family member. She received a scholarship to study in England. During her time in England, she converted to Christianity but did not ever lose sight of her goals for the social system in India. She clung to her roots and when she returned to India she helped put up Christian Churches which had Sanskrit writing instead of traditional Latin which was used in England. Ramabai attempted to combine her new Christian ideals with her old Indian Culture and used this mix to promote change in India. Being raised as in the Brahman caste made her uniquely able to bring both men and women to Christianity due to the caste’s image as social leaders. She wrote a book about her travels to the United States and it has recently been published in translation as Pandita Ramabai's American Encounter. The book is a traveler's account of the people and culture of the United States. It contains a pointed comparison of the status of women in the U.S. and India, and strongly suggests that India should follow down the path of reform. However, the book is not without its criticisms of American society, particularly its race problem. In addition to her writing she founded the Arya Mahila Sabha in 1881, the very first Indian feminist organization. She studied as well as taught about the issues which surround Indian women especially those involved in the Hindu traditions. She spoke against women who were forced to marry young and/or widowed young and wrote about the struggle involved in their lives. She established the Mukti Mission in 1889 as a refuge for young widows who were abused by their families. In Marathi, her native tongue, the word mukti means liberation. The Pandita Ramabai Mukti Mission is still active today, providing housing, education, vocational training, and medical services, for many needy groups including widows, orphans, and the blind.